The Magician robot controller is a low cost, Arduino compatible controller for beginners with everything you need to get started all on one board. USB interface and ISP socket for easy programming. ATmega8 controller preloaded with the Arduino boot loader (upgradeable). Dual motor controller rated at 800mA for each motor. Motor control circuit can be disconnected to provide additional digital pins. 8x 3 pin servo compatible outputs. 6x analog inputs with +5V and ground for powering sensors. 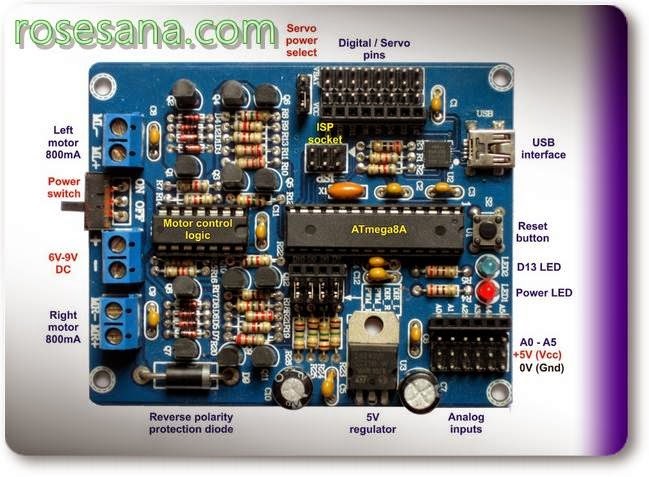 Servo power selectable between battery voltage or 5V regulated. LDO +5V regulator rated at 1.5A when used with a heatsink. Reverse polarity protection diode rated at 3A to protect servos. Quality screw terminals for power and motor connections. Power switch, power LED, reset button and D13 LED.